(reduction division) The process by which a diploid cell divides to form four haploid cells. The process consists of two consecutive divisions, each with a sequence of stages similar to those of *mitosis. During the first division, which is the actual reduction division, the pairing (synapsis ) and subsequent separation of *homologous chromosomes into separate nuclei results in the reciprocal exchange of portions of maternal and paternal *chromatids (see crossing over ). It is in this pairing and separation of homologues that meiosis essentially differs from mitosis (see diagram). The two haploid nuclei resulting from the first division then divide for a second time, during which the chromatids are separated as in mitosis. Four haploid cells are therefore formed. Meiotic division is the process by which the haploid gamete-producing (gametophyte) phase in the life cycle of plants is established. See prophase , metaphase , anaphase , telophase , cytokinesis. 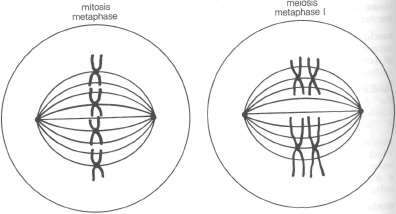 The basic differences in chromosome behaviour in mitosis and meiosis.